Here in Israel, reports of an assault on a French mosque on Friday are likely to be eliciting knowing nods. All of France is still on high alert after a series of ISIS terror attacks murdered some 130 people in Paris on seven weeks ago. Soldiers remain deployed throughout the country to protect public spaces, transit routes, official buildings and all kinds of religious sites. did not prove he had links with "terrorist groups... These are downloadable images that are a few weeks old. Not the worst type of images, but rather bellicose slogans," he said. "It shows he had an appreciation of that but it does not prove he had links with terrorist organisations." 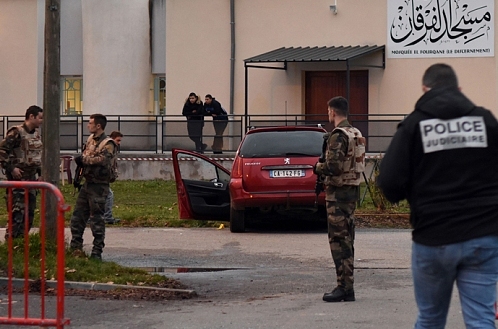 The vehicle does not appear [video via Euronews] to be speeding at the point when French soldiers opened fire after the driver launched two separate ramming attacks on them. In fact, it's moving very slowly. Nonetheless, an innocent passer-by was injured in the shooting. He's a 72-year-old Muslim man, a worshiper at the mosque, who was struck in the leg by a stray bullet fired by the soldiers. A soldier suffered leg injuries. We know some Israelis are thinking about whether the French security people are going to now be accused of engaging in attempted "extrajudicial execution". As for us, we're wondering whether any published analysis has come out that examines why a vehicle-ramming-minded Muslim would choose to attack people standing out in the cold day and night to protect and defend... a mosque. Might this be a variant of Munchausen's Islamophobia by Proxy? UPDATE Sunday January 3, 2015: Reuters reports (via Jerusalem Post) that the French authorities are considering charges of attempted manslaughter against the driver. Quoting "the local prosecutor", they say investigators have "ruled out terrorism for now... They said the 29-year-old Frenchman of Tunisian descent seemed to have acted alone in "a fit of anger" and did not appear to be linked to terrorist groups." Why acting alone is relevant may eventually come to trouble some French citizens, but for now it appears they have larger headaches [for instance, "Paris terror attacks: French police admit mistakes in response"] with which to contend.